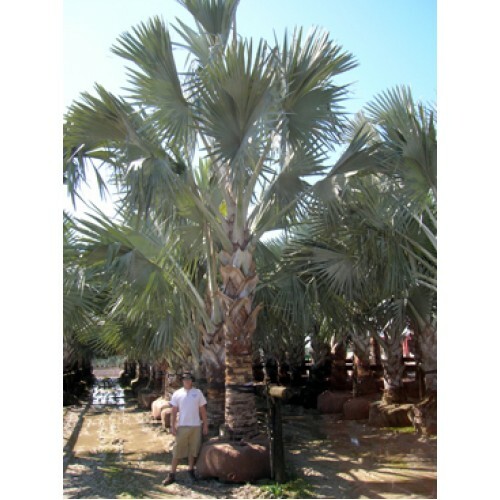 Looking for Bismarck palms for sale, you have found the answer in A Quality Plant, we sell wholesale palm trees in Florida. One of the most desired palm trees in Florida is the Bismarck palm tree. Since its introduction to Florida, it has become one of the favorite palm trees because of its ability to give a dramatic and spectacular effect to the landscape. The Bismarck palm tree can be planted to any landscape. Its benefit sto the environment cannot be dismissed. For example this plant has a good shade in case of a hot sun, and it can be used as a focal point for screening and for shade.Another benefit is the ability to change the landscape. Once it is planted at a place, palm trees will transform the landscape of a place, even at1.3 meters high. They also are environmental friendly, meaning that they do not contribute to the environmental pollution. When planted at home, they do not shed leaves to be raked. Rather they have foliage that are made of fronds which after growing old will be discarded. This happens not regularly but seasonally. Meaning they don’t have the burden of raking the compound every now and then. Everyone should consider our Bismarck palm because of their low maintenance. These plants require the least maintenance process compared to all other plants around. They will survive with minimal watering and little nutrition, and still grow bigger. Furthermore palm trees are not easily attacked by pests and diseases. Also when considering a plant that survives in most climates, the palm trees is the answer. They have the ability to survive in cold climates even though most of them are found at the coastal borders. They also do not select the type of soil to grow into. They grow in most soil types even though they grow most in sandy loam soils. Palm trees are found in different types and varieties. They are the same but in different colors, patterns and flowering shapes together with different colors and shapes. Among the types of palm trees that we offer include the Bismarck palm which goes at a price of $550.00 with an overall height of between 14 to 16 meters. The Bismarck palm we offer for sale has a single smooth truck with wide fronds that form a spherical crown. When young they have a grey trunk which is relatively rough but is gets smooth as it matures. The Areka palm trees are also among the tress found for sale, and they have an overall height of eight to ten meters. They are for sale at a price of $120.00. Another type of palm tree available is known as the sago palm or the cycas revoluta 7 Gallos, which is highly ornamental cycad. Its origin is in the Ryuku islands of japan. This type of palm is extremely adaptable and can survive in most climates. It is available in stock and goes at a price of $35.00.